It’s time to Get Growing! as Bristol’s secret fruit & veg gardens open their garden gates to visitors & volunteers so you can Get Growing too. This year, the emphasis is on Getting everyone Growing! so we have more vounteer sessions and workdays on offer alongside the normal garden open days. 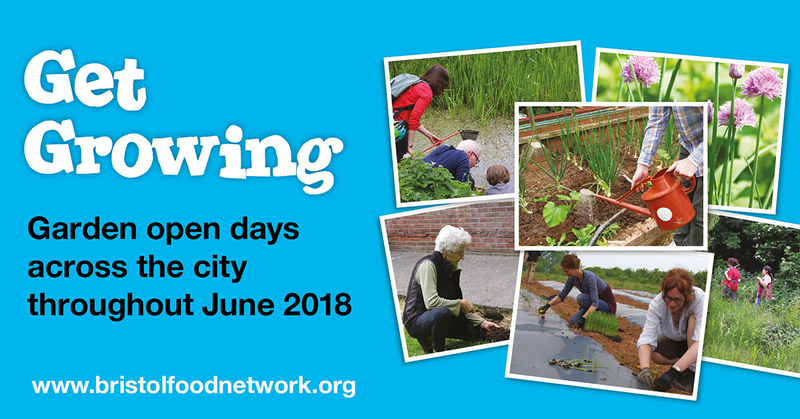 Plus Get Growing runs not just for one weekend in June as we have in previous years, but over the whole month – giving you even more opportunities to get involved. Or pick up a printed copies from community venues around the city. Hope to see you Getting Growing! STOP PRESS: The Incredible Edible Group at Dame Emily Park have moved their work party to coincide with the Bedminster’s Secret Gardens event over the weekend of 2 & 3 June. Meet at the Morley Road end of Dame Emily Park BS3 1DL for a work party 2–4pm Sunday 3 June. Shovels and toys for the kids. Coffee and cake afterwards for the workers!